I know I'm violating my own standards for this one, but frankly, it's a holiday, and I'm willing to relax the rules for myself on occasion. 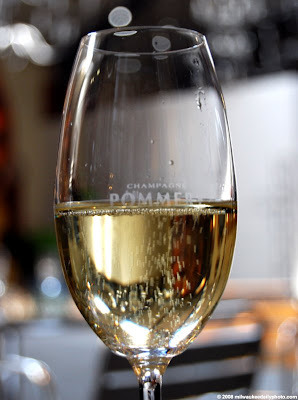 This glass of Cuvee Louise '98 was bottled, aged, and consumed in Reims, France, the home of Pommery Champagne, and a number of other champagne houses as well. I took this photo while on honeymoon this past May. A happy and healthy 2009 to everyone... I hope that the coming year is better than the past.